Strong social CRM. Great for developing and sustaining relationships. Best for companies with an emphasis on client relationships such as professional services firms. 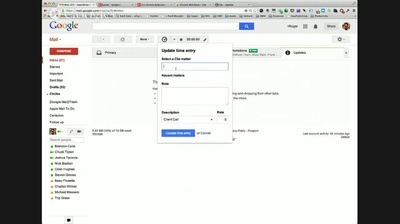 A great general purpose CRM for Google Apps. 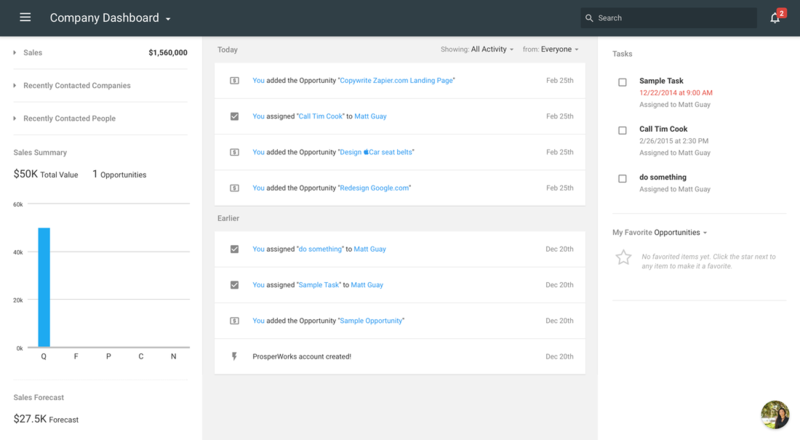 ProsperWorks seamlessly integrates with Gmail, Google Calendar, Tasks, Events, Drive, Docs and so much more. 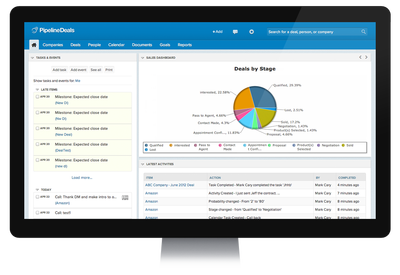 PipelineDeals is a sales focused CRM that enables B2B sales teams to get organized and sell more. Easily organize your sales pipeline, track leads and deals and manage tasks. Zoho CRM gives you a 360-degree view of your sales cycle and pipeline. Identify trends, spot opportunities, increase efficiency and reduce costs with the right answers, right now. Clio is a legal practice management platform that helps lawyers work more efficiently by making it easy to do tasks like tracking time, managing matters, and generating invoices. Close more deals, faster and drive sales sales productivity with Yesware. All CRM products all do fundamentally the same thing, they help you build and sustain profitable relationships with your prospects and customers. However, they all have their own strengths and weaknesses, some are stronger on transactional, high volume B2B sales, others focus on social selling, some have better integrations with other cloud applications while others are designed to fit the needs of specific industry verticals. At SmartCloud we made a strategic decision to steer away from larger CRM products, like Salesforce, Microsoft Dynamics and Sugar CRM, because we feel that, while they are excellent enterprise products, they are not the best fit for our customer base which is predominantly SMB businesses. Our sweet spot customers are progressive businesses with between 5 and 50 users. Using products designed for an enterprise business, where there are thousands of users, in a SMB organisation is a bit like using a sledgehammer to crack a nut - unnecessarily complex, too expensive and too unwieldy. 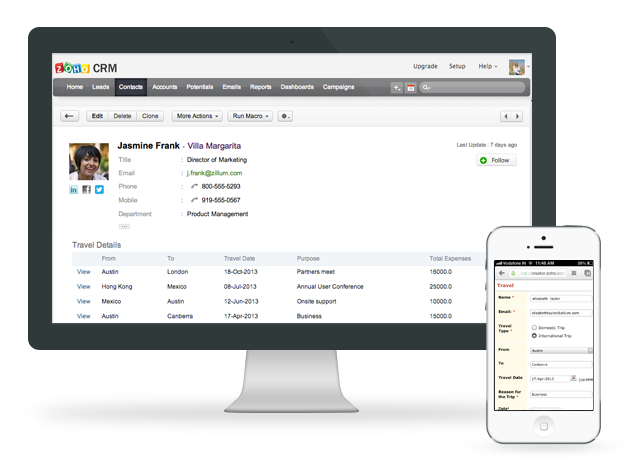 Instead we have assembled a portfolio of CRM applications which are focused on the SMB market. Each is different and each suits a different type of business. Our job is you help you select the most appropriate CRM for your business, get it setup with the minimum fuss, have users trained quickly and ensure that you gain the maximum ROI from your investment. Contact us now to set up your Free CRM Consultation and let us help you select the correct CRM for your business. Call us now on +353 1 960 9057 or send us an email by clicking on the button below to schedule your free consultation today. Nimble is the CRM for companies that are looking for a simple product that will help them be more productive and profitable. 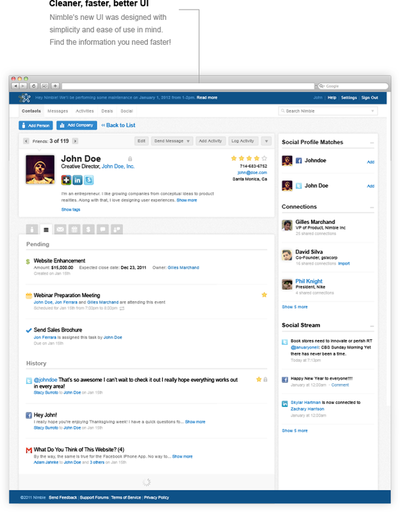 It is a CRM platform that has social media at its heart. Most CRM systems focus on Customer Relationships and ignore all the other relationships that also drive business success, but friends, family, classmates, colleagues, partners and even complete strangers also positively impact sales in a small business. Your relationships with these people will make or break your business success and they are harder than ever to manage in our noisy world. 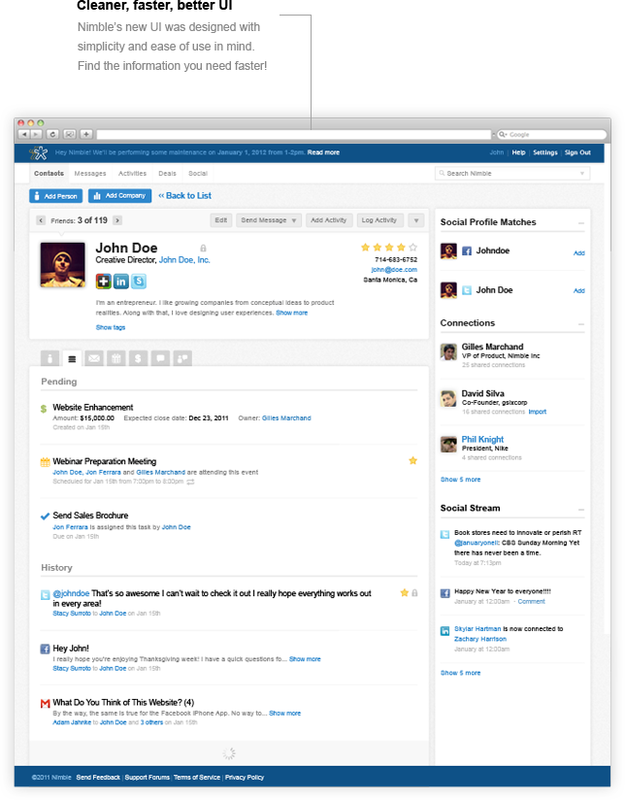 Nimble was built to smartly manage your relationships in one place. 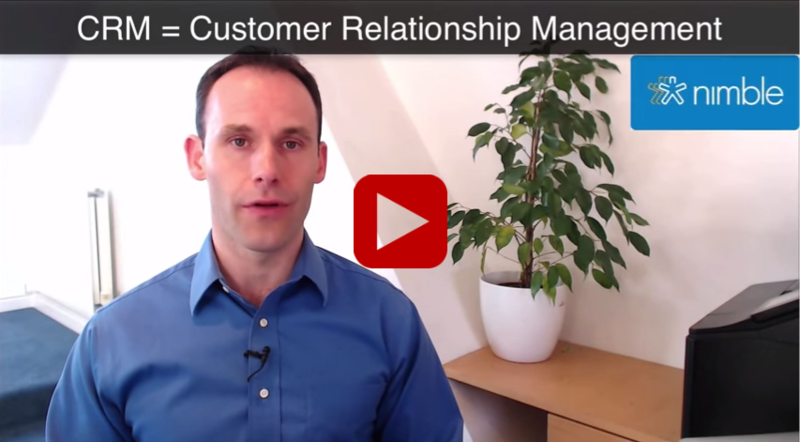 With intelligent context and insights about your contacts you can be quick, agile and smart with your relationships. You can be Nimble. 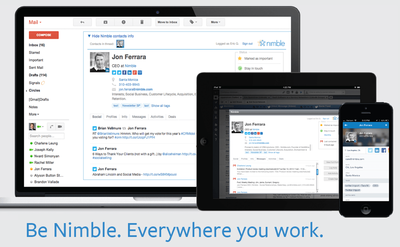 Nimble works for you and your team by automagically creating an Intelligent Relationship Platform. It unifies all of your contacts, your Gmail or Outlook email, your calendar activities and the most popular social channels (Facebook, Google+, Twitter and LinkedIn to name but a few) in one easy-to-use, Web-based solution. Unlike many CRM products available today which are costly and complex, Nimble is designed for small and medium-sized businesses, Nimble is the next evolution in CRM – a social relationship manager that is lean, clean and easy to use, but has the power and flexibility to scale and grow with you. No more data entry! 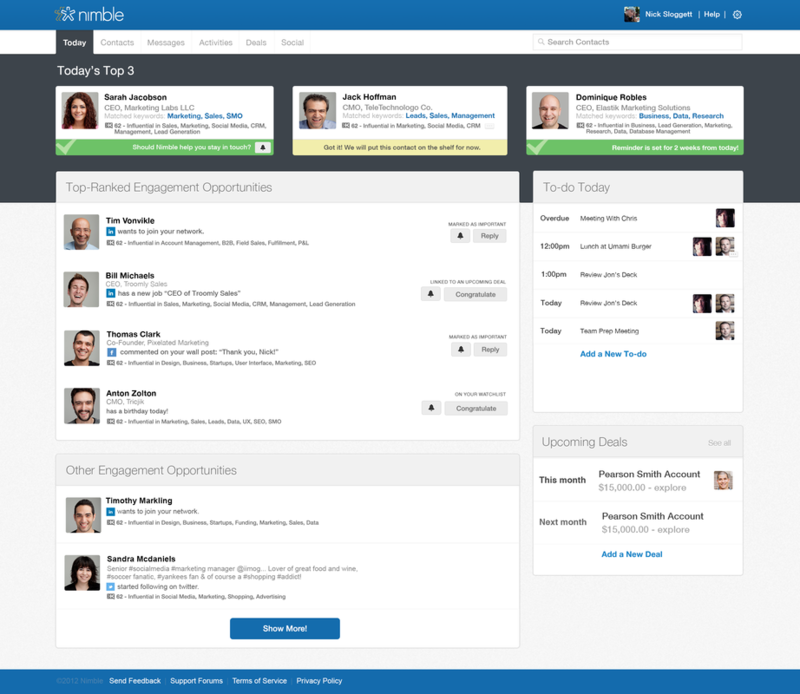 Nimble's 3-D view of contacts is automagic and rich in detail. Never miss a bit - Notes, Reminders, Meetings & Follow-Ups all included. Social listening for contacts, prospects. All the Signals you need, none of the noise. 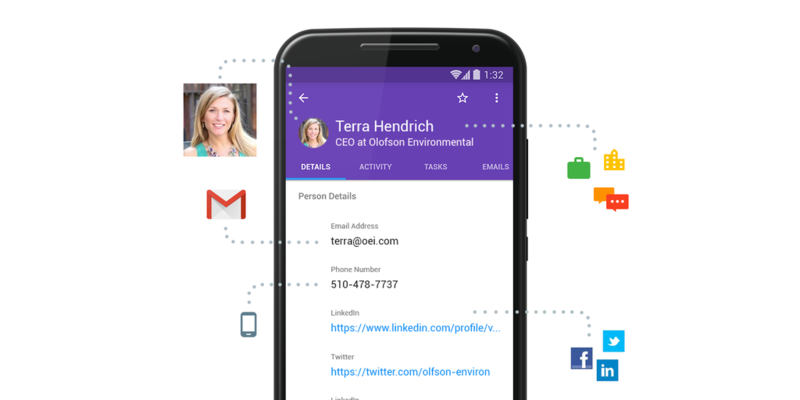 All your contacts, emails, @mentions, and social messages synced at your fingertips. Sending or receiving. Pipeline management has never been more straightforward. Ties to all Contacts, Activities. 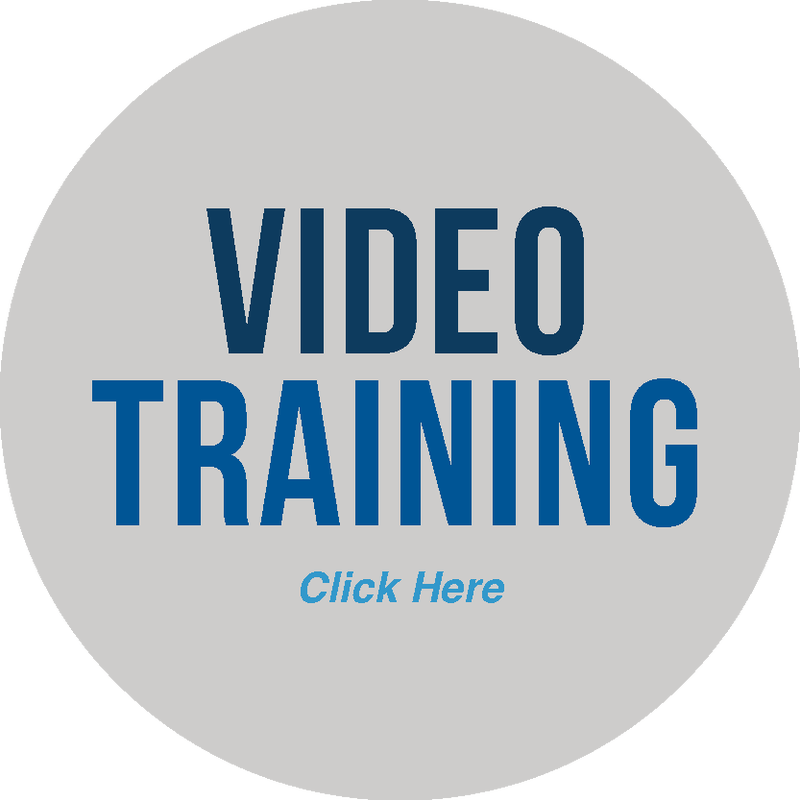 If you are missing out on thousands of potential customers by failing to use social media marketing properly then we recommend this excellent online Nimble training course from social selling expert Ben Tristem. Effectively move your leads through your pipeline. Focus on later stage opportunities. 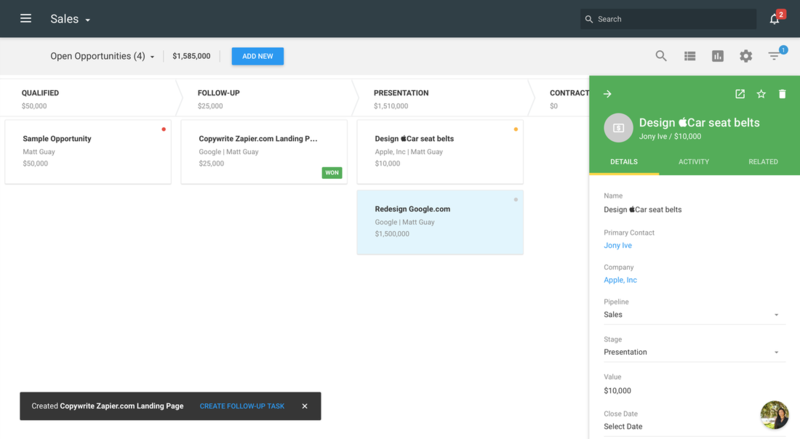 ProsperWorks is the simple CRM for Google Apps. 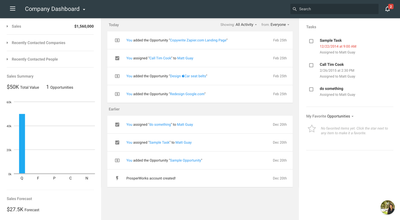 ProsperWorks helps you and your team sell more faster by identifying, organizing and tracking contacts and sales opportunities right in Gmail. Since ProsperWorks requires far less data entry, salespeople can focus on their deals and managers can make better decisions with accurate, real-time data. With a modern intuitive interface there is minimal training required. - Sell more with less work. ProsperWorks cuts down on data entry by automatically logging your emails, meetings, file attachments and more so that you have all of the information about your prospects and customers at your fingertips giving you more time to spend on closing deals. Robust reporting means that you can easily visualise your sales pipeline and quickly drag and drop sales opportunities to their correct stage. Visualise deal progress quickly so that you can focus your attention on the right places. 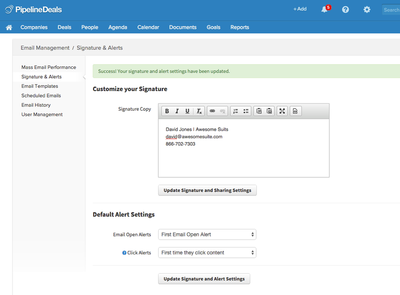 Bring CRM functionality to your Gmail inbox. 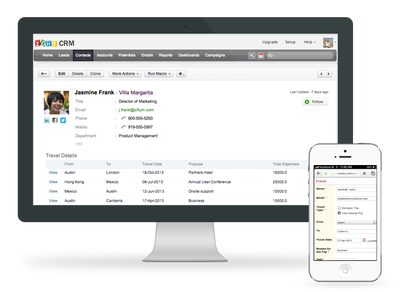 All the benefits of CRM without the data entry. Visualize and manage your pipeline the simple way. Follow up on time, every time. 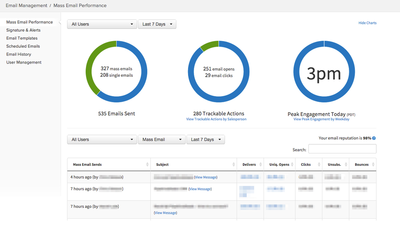 Automatically discover CRM data from your Gmail account. Quickly clear out contacts that aren't leads. View all customer interactions in one place. 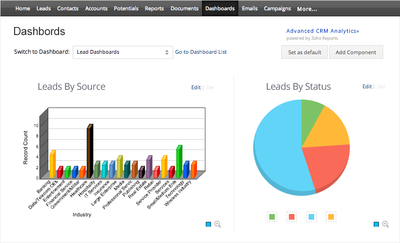 Kanban-style board to manage leads - Know where your deals are at a glance. Having accurate, comprehensive and up-to-date customer data gives your team the edge they'll need to win deals and saves them time from hunting down information from multiple sources. PipelineDeals is the most efficient way for B2B sales teams to get organized and sell more. It has all of the goal-setting, forecasting, and reporting capabilities that sales managers need. With PipelineDeals, salespeople will stay on top of their deals and prospects, and build stronger relationships with their customers. PipelineDeals simplifies your ever growing list of leads, suppliers, employees, and casual contacts through customised search - a real language filtering system that makes it easy to find just the contacts you need to get in touch with. 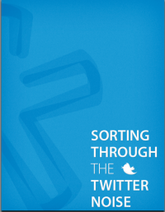 But there's more to PipelineDeals than just simple sorting. You'll also find rich 3D charts that give you a quick glance at how your sales efforts are performing, along with a daily email that shows your progress and what you'll need to do today. The internal notes you can add to a contacts go further than they do in most CRMs, with comments and notifications to your team members that make it more like a social network for collaborating on your sales work. And when you attach an email message to a lead, it'll pick up related attachments and show them as files right inside your CRM. 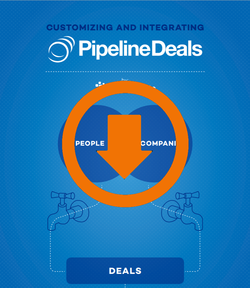 Download the BedrockData guide to customising and integrating PipelineDeals. Use Pipeline Deals to manage all your business deals, customers and prospects. Use one single template to organize files, documents, notes, and maps. Set up a list of contacts and their associated deals. Create a pie chart and reports illustrating the status of your deals. Prioritize possible deals with a higher percentage. 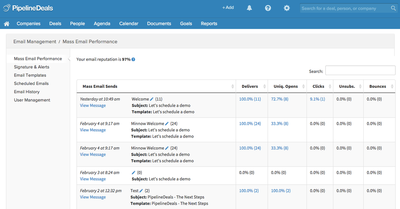 Remind yourself of upcoming meetings and deals with the PipelineDeals reminder feature. Prevent the loss of your data with Secure File Backups which offers data backup. Copy your data and export it to other applications. PipelineDeals will send a reminder on your cell phone. Share your documents with your co-workers through PipelineDeals. PipelineDeals is 100% web based, it offers low ownership cost and no long term contracts are required. Accelerator - the email acceleration tool for salespeople who want to sell more deals faster. PipelineDeals have just released Accelerator, a powerful new tool for sales that will help you qualify leads faster and move more deals through your sales pipeline. Accelerator lets you know who opens your email, clicks or downloads content, and how to best follow-up with your leads. 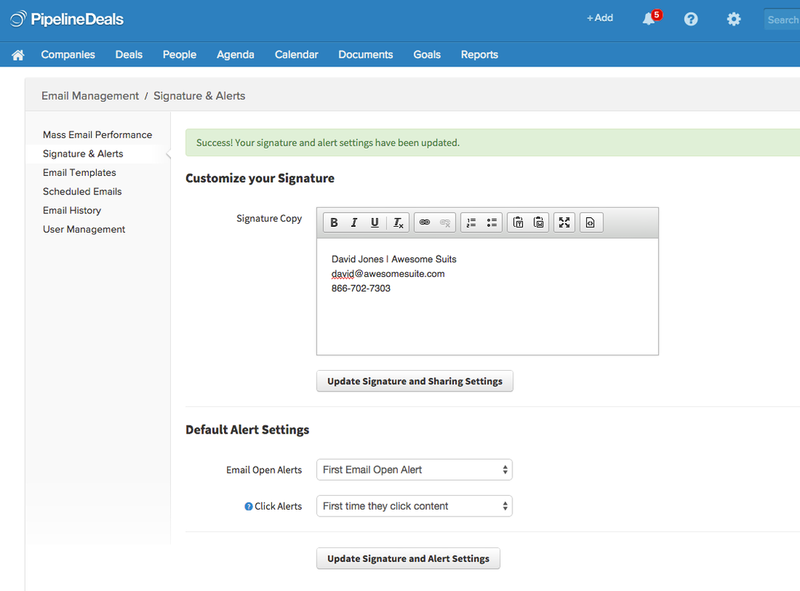 Accelerator is native to PipelineDeals and lets you send and track email directly from your CRM. With Accelerator salespeople know when they have someone’s attention and they can prioritize and personalize how to follow-up. The introduction of email acceleration helps salespeople sell more with less effort. Zoho CRM is just one of the many product offerings that Zoho has. The company has focused on building out a suite of cloud apps that includes office applications, a reporting application and a fully baked CRM that rivals some of the top systems on the market today. Zoho CRM is a great alternative to Salesforce.com, especially for small to medium sized businesses with growing sales teams. Zoho CRM is also affordable (much more so than Salesforce.com): you can get onto Zoho CRM with a small team for free, though the features will be limited (the free version does not integrate with email for example). The Professional Edition probably offers the best value for money. Zoho CRM is very straight-forward and easy to use. The system design is very similar to competing CRMs such as Microsoft Dynamics, Salesforce.com, Sugar, etc. Zoho gets high marks for usability and speed, its intuitive interface makes it relatively easy for salespeople to get up to speed with it quickly and it is relatively straightforward for an Administrator to manage. The search functionality in the system is also excellent. Zoho makes it easy to get the complete picture of your business with a 360-degree view of your complete sales cycle and pipeline. Identify trends, spot opportunities, increase efficiency and reduce costs. Zoho CRM frees you to do what you do best: selling. Automate tasks, improve workflow and focus on creating and capturing opportunities. Zoho CRM’s Opportunity Tracking tool gives you a comprehensive view of all your sales activities. Know where every customer is in the sales cycle, deal size, contact history, even competitor information to help craft more effective messaging. 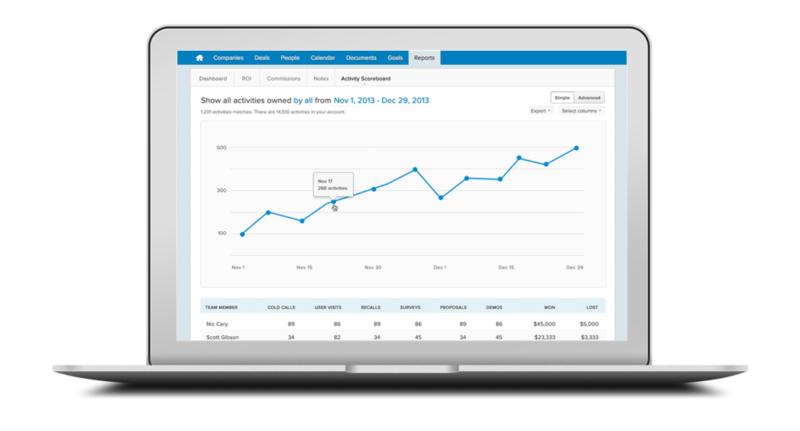 Dynamic Reports & Dashboards provide an easy, accurate read of everything going on. 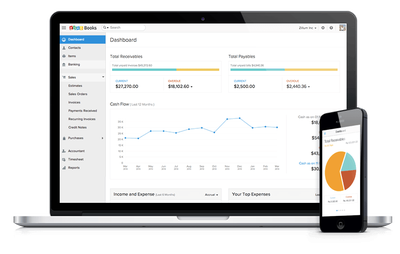 Features like custom modules (objects), Deluge Script and integration with other Zoho applications means that there really isn't much that you can't do in ZohoCRM that you can in larger and more expensive alternatives like Salesforce or Microsoft Dynamics CRM - making ZohoCRM a great alternative for small, growing businesses who may not want to spend the money on a system like Salesforce. Here are a few suggestions which you could integrate with Zoho CRM to help your small business grow and run more efficiently. Zoho Creator with its drag-and-drop builder makes it extremely easy for business users to build their own custom apps. Manage your company's business processes with Custom Workflow by setting rules, adding logic and creating if-else scenarios. Save on time and resources by building Apps using Zoho Creator. Creator stays in the cloud and so you save big on infrastructure. The ROI on an App builder is very high as you will be able to build a variety of Apps in future. Meeting is a collaboration tool that allows you to set up meetings with users and then display your desktop to the attendees. You can also allow certain members of the meeting to take control of your desktop. This is a great way to do long-distance training, show off a desktop product, or whatever is necessary. All accounts offer unlimited meeting duration, session reports, embed meetings within your web site and the ability to switch presenters. Recruit is an applicant tracking system that allows you to keep track of your applications, hires, and more. Although Zoho Recruit is targeted for agency recruitment firms and corporate recruiters and talent acquisition departments, it can easily be applied to any business that has a fast turnover rate or hires a lot of temporary (or seasonal) employees. Recruit offers: Sourcing and resume management, client and contact management, job posting, resume parsing, work flow and candidate experience. 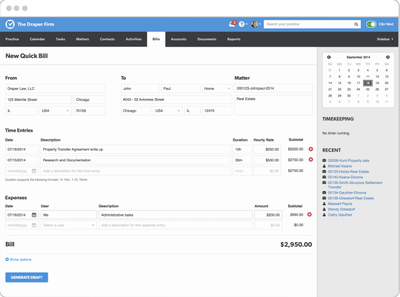 Invoice brings to your business a core function for all small businesses. Without invoices, you don't get paid. Zoho invoice allows you to manage estimates, invoices, customers, recurring invoices, billable expenses, non-billable expenses, products and more. You can create incredibly custom invoices and email or print/snail mail to clients. 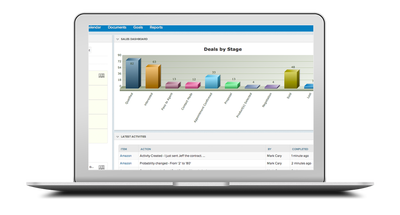 Reports allows you to generate dashboards, graphs, and other tools to help you analyze your business data. You can import data from spreadsheets and databases, or input directly into empty spreadsheets/databases or create from templates (all within the tool itself) and then generate the reports from there. 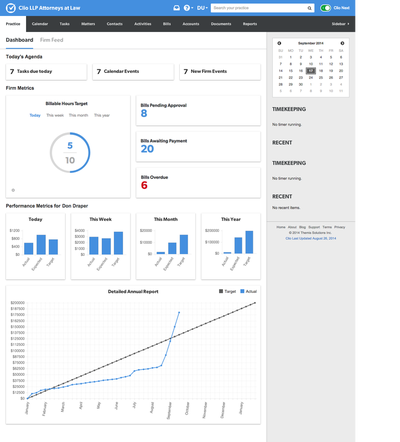 Reports allows you to: Analyze profits, trends; generate powerful dashboards with custom features; view performance measurements; extract and view OLAP data. If productivity is the name of the game, Zoho evaluators will want to check out Projects, a delicious program wholly unaddressed by the Google Apps lineup. Featuring compatibility with MS Projects and Google Apps, Projects encompasses portal-building, tasks and milestones, document management, time tracking and billing, calendaring, wikis, bug tracking, group chat, and much more. The one-project version is free to try, but businesses will want the paid product for its project templates, reporting, Dropbox integration, and other features, depending on the subscription plan. For more information on the complete suite of Zoho products, click here. 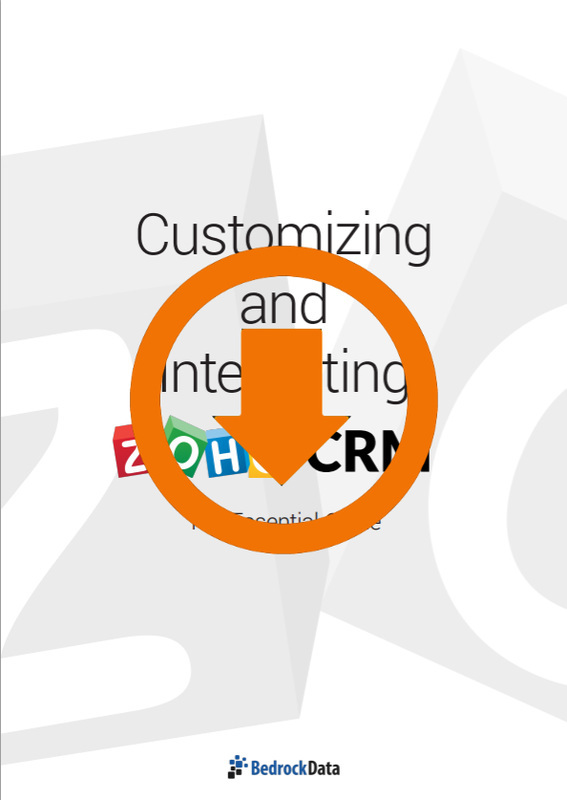 Download a comparison of Zoho CRM editions. 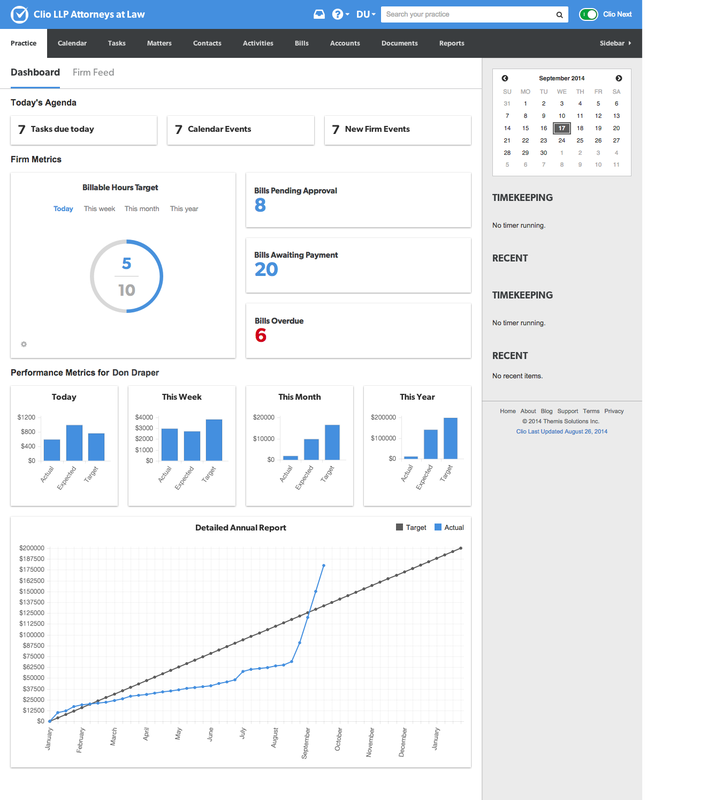 Clio is a legal practice management platform that helps lawyers work more efficiently by making it easy to do tasks like tracking time, managing matters, and generating invoices. Stop spending your time tracking down missing files, calculating hours, and creating invoices. Clio keeps everything organized and in one place…your matters hours, and client details. 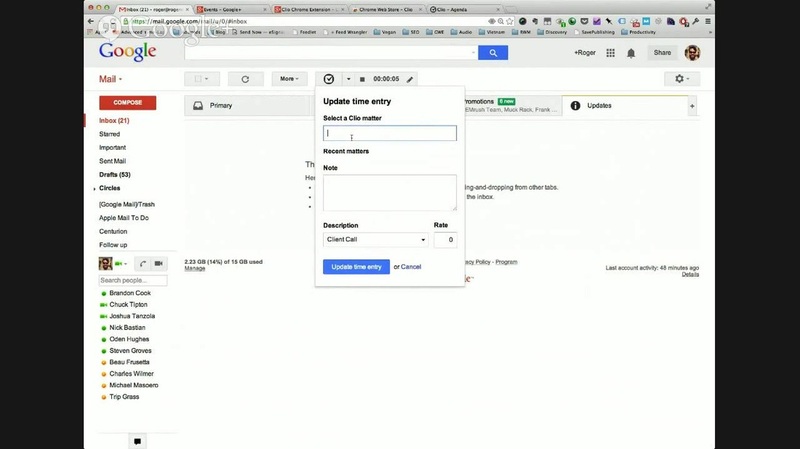 And Clio lets you bill time from tasks and generate the invoice as you work on them. So, you can spend more time actually doing things you want to do. Lawyers really, really love Clio's time tracking and billing features and for good reason. Clio saves them lots of time by completely streamlining the time tracking and billing process. Bill anywhere, any time. Initiate time tracking on a matter instantly, from anywhere in the app. Track your time on desktop, tablet or mobile. Associate hours to a matter, instantly. Track your hours and assign them to matters in a snap. Bill beautifully. 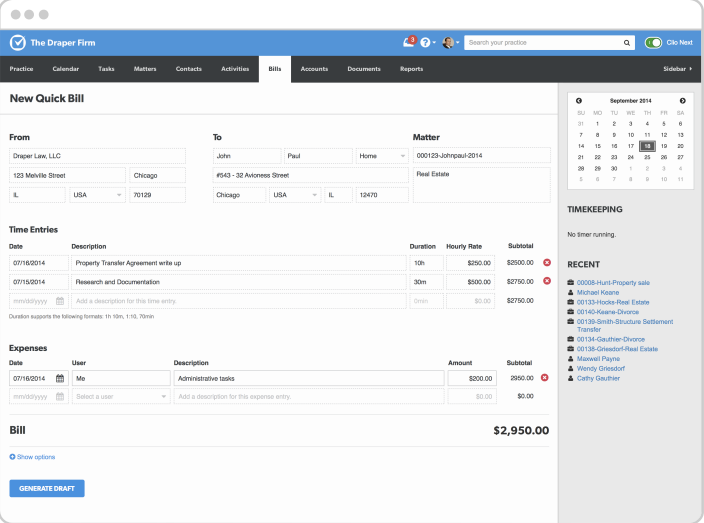 Create professional looking invoices with just one click. Clio works beautifully on iPhone, iPad, Android and Blackberry devices so you can manage your business from anywhere. With Clio, your data is stored in the cloud and is kept safe on our secure servers. This means that you can confidently access essential information and data from any device, no matter where you are. Clio gives you the data you need to make smart decisions about your business. From productivity to accounts receivable, all are a click, swipe or tap away. 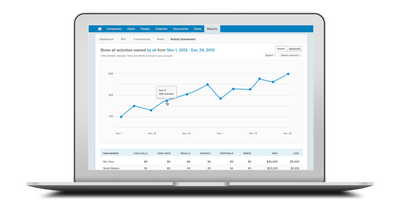 Manage your practice in real-time, from anywhere - Keep an eye on client and lawyer productivity at a glance with real-time reporting. Comprehensive reports in a flash - Keep your clients in the loop with a variety of handsome reports detailing tasks, works in progress, bank account activity reports and more. 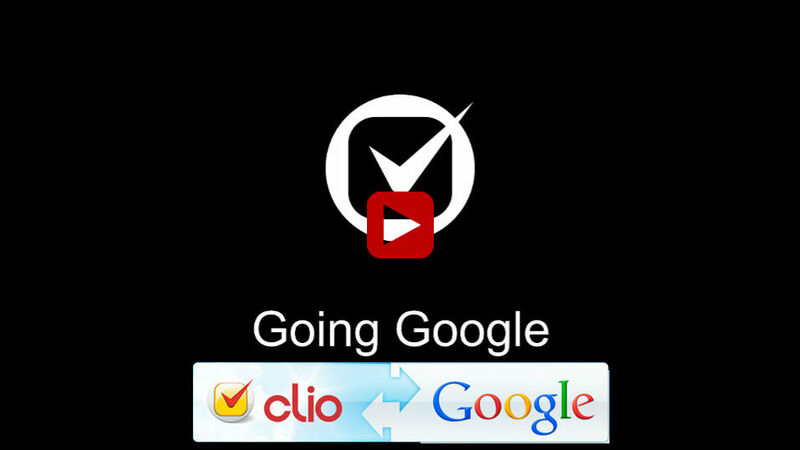 Clio puts your busy schedule at your fingertips, anywhere. We can't guarantee that you'll never be late for another meeting, but we can guarantee that you’ll have your daily, weekly and monthly upcoming meetings at your fingertips—no matter where you are. Create calendar entries in a snap (or a click or a swipe), Clio's handy interface makes creating calendar entries quick and easy. Just like they should be. No more long forms to fill out. See what your future holds by easily viewing your daily, weekly or monthly appointments. Calendar entries are easily associated with matters — so you can track time and generate bills all in one place. Clio's range of features are available on any operating system and pretty much any browser. Confidently integrate Clio into your team's process without calling IT. Clio works to the latest web standards and is updated whenever a new feature is perfected. Clio isn't updated every year or every month, it is updated on a rolling basis, which is usually every single week. Stay up-to-date with your practice no matter where you are. Clio keeps you in-sync with your team whether you are in the court house, at home or even on vacation. Kiss syncing goodbye - With Clio, syncing is a thing of the past. Our cloud-based infrastructure stores all of your data securely so that you can be sure that everyone on your team is working with the most up-to-date data available. Never waste time searching for a USB cable again. Built for legal practices - No one can be at the office all the time. 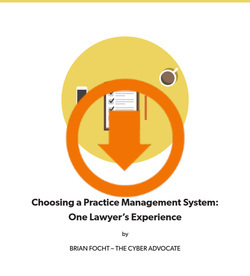 Whether you’re at the courthouse, at home or just enjoying some fresh air, you’ll have your practice at your fingertips. Clio was built for collaboration. If you like endless email threads and impossible-to-find attachments, then maybe Clio isn’t for you. But, if you like collaborating with clients securely and efficiently, then this could be the beginning of a beautiful relationship. Your favorite apps like Dropbox, Google Apps, Box and more all integrate seamlessly with Clio. Clio integrates seamlessly with the full suite of Google Apps — including Google Drive, Calendar and Contacts so you can work together with your clients to coordinate documents, meetings and more. 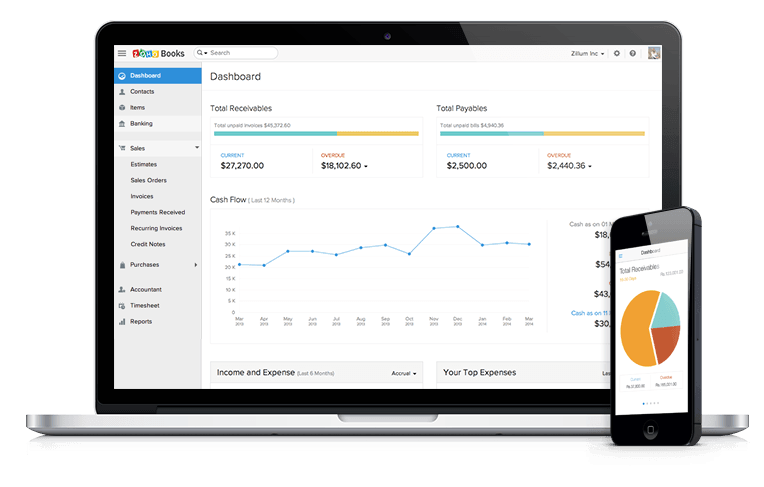 Billing is easy, Clio allows you to track your time, create invoices, generate (beautiful) bills. 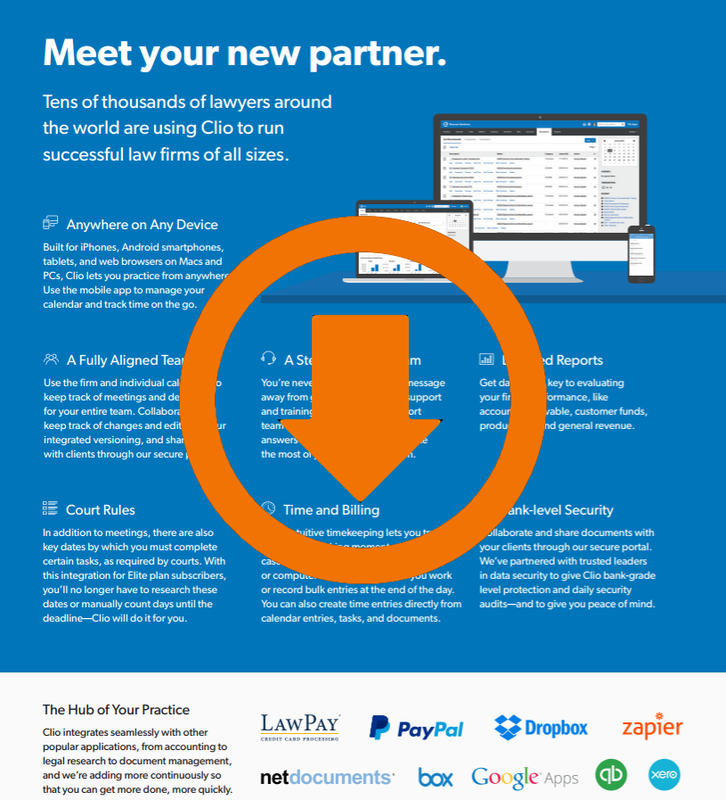 Clio integrates with PayPal, LawPay and Law Charge so your clients can pay with a click. Get together, anywhere with Clio Connect. Our tried and tested Clio Connect platform is a sharing portal that opens a collaborative dialogue between you and your client, making creating and editing documents a breeze. Say goodbye to bottomless email threads forever. Link tasks to matters, assign to-dos to other team members, monitor the progress of tasks and do pretty much anything else needed to keep your practice running smoothly. In short, Clio lets you get things done. Find what you’re looking for...what a novel concept! Clio makes it easy to view all tasks across all of your matters or drill down to specific details with just a couple of clicks. Clio uses industry leading SSL encryption and conducts daily security audits to ensure that your data and your client's data is secure and immune to third party monitoring so that you can work confidently. All EU based accounts are also hosted in Clio's secure data centre in Ireland and their data never leaves EU jurisdiction. SSL encryption - Lock out 3rd Party Eavesdropping with SSL Encryption. All communications on Clio are completely secure so you and your clients can communicate openly. SAS 70 type II certified - SAS 70 holds the most stringent standards in customer data security and has been the authority in customer service data for the past 18 years. Security audits every 24 hours - Clio's servers undergo a rigorous daily audit by McAfee security. Clio’s dedicated security team is immediately notified if any potential security risks are identified.